Gilbert Adair has been quietly turning out delightfully idiosyncratic, and impressively slim, novels for almost 20 years now, but has never really struck a chord with the greater spotted British reader. Probably this is because his books tend to be what one might, in the spirit of one of Adair’s narrators, call “too clever-clever by half” – and I love them. They range from black comedies with a gay undertow (Love and Death on Long Island, filmed with John Hurt, and the superb Buenas Noches Buenos Aires) through Hitchcockian romps (The Key of the Tower) to tricksy conceits (A Closed Book, told entirely in dialogue). His best novel for me though is 1992’s The Death of the Author, a Nabokovian satire on culture and sexual politics. 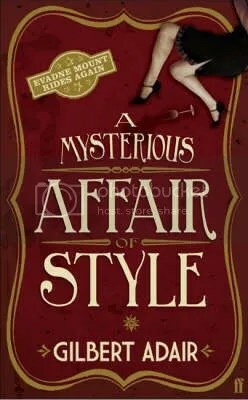 In 2006 Adair took his smarts in an entertaining new direction with a pastiche of Agatha Christie-type mysteries, entitled – cleverly, of course – The Act of Roger Murgatroyd, which was not only a terrific play on one of Christie’s most famous titles, but also the only murder mystery I know of where the identity of whodunit is revealed in the title (and believe it or not, that’s not a spoiler). It introduced us to ‘the dowager duchess of crime,’ novelist Evadne Mount, who solved a perfect little country house Boxing Day murder in around 300 pages. I’ve always made it a point of honour never to repeat myself. Later, however, it occurred to me that I had never written a sequel before (to one of my own books, at least) and hence, applying what I acknowledge is a slightly warped species of logic, to write one now would represent another departure for me. It’s my theory, you see, that the tension, the real tension, the real suspense, of a whodunit – more specifically, of the last few pages of a whodunit – has much less to do with, let’s say, the revelation of the murderer’s identity, or the untangling of his motive, or anything the novelist herself has contrived, than with the growing apprehension in the reader’s own mind that, after all the time and energy he has invested in the book, the ending might turn out to be, yet again, a letdown. In other words, what generates the tension is the reader’s fear not that the detective will fail – he knows that’s never going to happen – but that the author will fail. It’s hard to say much more except that Adair handles the pace slightly less well than in The Act of Roger Murgatroyd – despite this book being a little shorter, there are more longueurs – though the characters are cleanly distinct and the whole is pervaded with a sense of playfulness. The solution to the central mystery did not seem all that surprising to me, which made me wonder if there is another, deeper, solution buried in the text. It would account, after all, for those repeated and obvious typos which I began to suspect were clues (take the missing letter from each…), and also for the title, which otherwise has no direct meaning for the plot. There’s only one thing for it. You’re going to have to read it too and help me out. The parody crime novel: together we can crack it. Nothing to do with your post at all! I love Agatha Christie and have read all her books about ten times since I was a child. I have never heard of Adair and now I must seek him out. I am a little confused though. Is Death of the Author the third of the trilogy? Candy, this is only the second in the trilogy and has just recently been published. The Death Of The Author is a stand alone novel. Great review as usual, John. I’ve been wanting to read this since I found out about it a couple of months back. But, to do that, I’m going to have to lay my hands on a copy of The Act Of Roget Murgatroyd first. Not that, I suspect, there’s much call to read them in sequence. Okay I have already ordered those two from the Book Dep. I guess I will give Nemirovsky a miss for now. Perhaps you guys will give me a heads when the third one is published. I do not want to see my credit card bill this month. Oops that was a heads up. Well I suspect you might get even more out of them than I did in fact, Candy, because apparently they’re chock-full of references to Christie and the like, most of which I missed of course. Adair wrote here last year on his experience of re-reading all Christie’s novels before writing The Act of Roger Murgatroyd. And thanks for the hit, sara! I will have to ponder on who to tag now! I have never heard of Gilbert Adair but you have convinced me to read him. Black comedies with gay undertow are definitely up my alley. Hello, everyone. I have to read The Act of Roger Murgatroyd and A Misterious Affair od Style because I have to analyze them in my degee thesis, comparing them with Agatha Christie’s books they’re based on. Does anyone of you know where I could find something about Gilbert Adair and his style? Maybe it is not the right place to ask something like that, anyway I hope anyone could help me. Maybe try searching for some interviews with him, kit? Otherwise it looks as though you might have to read the books and make up your own mind! Thank you very much, I’ll try searching for interviews, then. I am in the middle of reading this at the moment and am quite enjoying all the Christie / Hitchcock refrences but MASSIVE SPOILER TO FOLLOW DO NOT READ ON IF YOU HAVE NOT SEEN “THE MOUSETRAP”!!!!!!!!!!!!!!!!!!!!!!!!!!!!!!!!!!!!!!!!!!!!!!!! He reveals the murderer of the mousetrap by having the policeman be the killer in Mounts play “The Tourist Trap” I am a big Christie fan and made the effort to go to London to see the play, not knowing who did it prior as I made the decision not to read it first. This in MHO is a bit off as it is an unwritten rule not to let on who done it! Other than that still enjoying it! Thanks for the comment, George. Sadly, the identity of whodunnit in The Mousetrap is one of those secrets which is probably more known than kept, even among people (like me) who haven’t seen the play. Probably Adair knew, or believed, that. Perhaps you are the exception! I will be interested to know what you think of the third book in Adair’s trilogy, And Then There Was No One, too (also reviewed here). Very different from the first two, but in my opinion much more satisfying.